Well I finally finished these two awesome books . 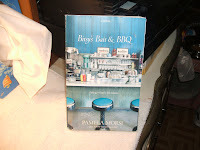 Bitsys bait and bbq was an awesome book about a woman starting life anew with a child . It is so good . It is by Pamela Morsei . Read it if you get the chance . 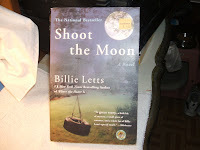 The second book is called shoot the moon by billie letts . It is about a woman who had a child and she and the child were believed to be both murdered but the child returns as a grown up to find out what really happened to his mother . Oh well kids that is about it for today unless I receive something really cool in the mail . Be carefull out there among them english and negative ghost rider . There is a stationery give away over at this website run by melody . 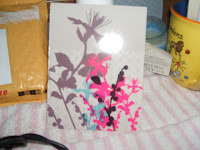 S.mail ~ A Penpal Experiments. 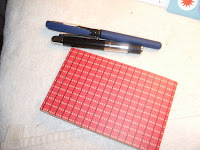 These ladies are having a wonderfull stationery give away check it out and maybe you will win . Go have a look and have fun while there . Here we go again a notebook giveaway at this website http://www.notebookstories.com . Go over and check it out kids looks pretty good to me . Let me tell you I am proud of all of us and the way we responded to that stupid ignorant letter posted to an editor at the idaho state journal . We d moms are an awesome force to be reckoned with and nobody wants to mess with us . When we all join forces there is nothing that we cannot accomplish !! I think we did the d community a great service today and I must say kuddos to Ms. shamae for posting this and letting the rest of us take action . I must say we made a statement to that paper you can bet your bottom dollar on that . That paper now realises that they probably should have not published that letter at all and are rueing today . Oh well my, a little late now fellas . Next time put brain in gear before mouth and fingers in motion . I bet we made them realize that they will think twice before posting an arogant letter from some nitwit who obviously did not think about what they were writing before they wrote it . I am so proud of us that my buttons are popping . We are an awesome group yes we are and I am so proud to call all of you ladies my friend. take care and be carefull among them english and negative ghost writer . Oct. 3, myself and my girlfriend were eating lunch at Burger King. A family came in and sat across the aisle from us. While the father was ordering food, we were shocked and appalled to see a boy inject himself with whatever medication, in front of God and everybody all while sitting at the table. We found this extremely offensive. That sort of business should be done in private. How about a little respect for those around you. Other than the obvious fact that it's not sanitary for those who use the table next, you have no idea how something like that can affect people. People go through a lot in their life and things like that may bring up certain feelings and memories best forgotten. I would like to thank those that day for totally ruining my meal. This is what I was talking about when I responded to this the post before . Hey kids the following is the letter in response to a newspaper article let me know what you think . I sent this as soon as I got the info from ms shamae thank you very much my dear . Just let me know what you think . I must respond to a letter to the editor from a woman who made a comment about a child who was injecting his self right there in front of God and everybody (her words not mine ) I am appauled I am a type 1 diabetic and have been so since I was 16 yrs old and am now 47 . This woman is ignorant !!! she could have used this expierience to teach her son about diabetes and how insulin keep us alive , but no instead she re enforced the ignorance and intolerance that I have faced all my life since being diagnosed . If everyone thought like her diabetes would still be in the dark ages . No I will not inject my insulin in the bathroom to make someone else comfortable and frankly if I was asked to do that , I would get up and leave the restaraunt . I find this attitude of this woman appauling and I hope she is a rare case in your community . well I hope I did us all proud who are fighting this horrible disease everyday . oh well be carefull out there among them english and stay well and negative ghost writer . Please go over and read this blog entry and find out why I am so peed off !!! I am 47 yrs old and have had t1 since I was 16 yrs old . So You can see from her blog why I am so angry . Please go read her blog and comment at her blog and at mine please . let me know what you think . here is the name of her blog .Welcome To Our Crazy, Happy Life! . Her name is Shamae and she is an awesome lady and a great mom . Im not angry with her it is what I read about what she saw in the paper . Please just go read and you will understand . thanks guys and please feel free to come back and tell me if I have the right to be angry . Be carefull out there among them english and negative ghost writer . Hey kids how is everyone ? Just a quick note for you all to check out a website giving away a cookbook of slow cooker recipes . It is 365 daysofcooking.blogspot.com . check it out . Karen is a great gal and she has been blogging about cooking for a while . She has some awesome recipes and I have actually cooked some of them . Tommorow I will start blogging regularly again . Just things have been catching up with me and I want to scream . Oh well be carefull out there amoung them english and negative ghost writer . A side note let us all pray for holi a dear friend who is in a coma and suffering from the H1N1 virus and you can read about her at candy hearts blog or ladylakes blog . I called my minister and he added her to our prayer list and we are all lifting her up in prayer for a speedy recovery if it is Gods will . Oh well folks please pray for Holli and her family in this time of sorrow . Well I finally finished this book . I read this book and the ending was really sad and did not care for the ending at all . I mean all and all it was a good read but a totally unexpected ending . You all must read this book if you read picoult . Okay enough about the book . I have been on the roller coaster for the last few wks going from high in the morning to low at night . I dont understand what is going on as I know this is so confusing and I have been at this for awhile folks and it just does not get any easier with time and it can take just one tsp of something to throw your bgs off . I just am so frustrated with all of this and it is a struggle everyday for us to face the day sometimes and a battle . Okay I m done venting and ranting and raving I think . Well be carefull out there among them english and negative ghost writer . Since you all have not really seen my arnold well here he is . 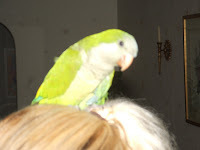 This bird is the love of my life and he will always be mine . He is also best friends with my male chi the female chi does not care for him too much . he is an awesome bird and just has so much personality . He is so easy going and is not much work at all either . Oh well enough for tonight folks talk to you later . This picture is the back of the ringling museum located in sarasota florida . It is absoloutly beautifull inside as well as out . The ringlings did not live here long . Mrs ringling passed away from complication of influenza . Inside the museum they actually have the clothes that mr. ringling wore . Inside it is decorated in the style of venice italy , which Mrs Ringling was very fond of . Mr ringling was reported to have sunk a boat in the bay behind this home . He also had big dogs which he loved and at that time it was unheard of to have a dog in your home .If you would like to know more just google John Ringling . I was impressed with the whole tour and the home and the museum . If you ever get the chance to visit do so . that is all for today folks and be carefull out there among them english and negative ghost writer . Hey all this book is awesome . This has to be one of Picoults best . to be awesome too . Oh well kids just catching up with everyone and hope all of you have an awesome day or night depending on where you are . Okay be carefull out there among them english . Negative Ghost Rider . to hear Sam tell it . She also participated in WW2 and I hope I am getting all of this right . If not Sam will be sure to tell me that I messed up . I know some of you know Sam and follow him . But something tells me he just needs to hear a great big hello today . God bless Sam and I both he is doing better . Thanks Sam and this notebook is way too cute to write in LOL !!! take care everyone . when I made a decision that would change my life in a way I did not see coming . I saw a sad little quaker baby in a cage with a broken wing . The breeder told me she was going to euthanize all of them including arnolds siblings .I broke down right there and called my cousin and asked her to come meet me it turned out to be a rescue mission . we gave the breeder twenty five dollars for all the babies including arnold she said they were too deformed to sell . right then we scooped all those babies up . I always tell ppl that was the best 25.00 I ever spent in my life . For those of you who dont know I do rescue work and also went to new orleans after katrina hit to see what we could do for those poor dogs and cats and pets that got left behind . I crawled through muddy underpennings under houses and I was glad to do it cause I want to be sure that I leave something behind when I leave this earth . The babies that you cant save are the ones that stick out the most in your mind or the ones that die on you on the way to the rescue station . I will never forget them . I will also never forget driving from new orleans to mobile alabama without a shower and the hotel owner who let me pile ten dogs in the hotel room with me and she brought food , dog food and extra towels to wash the dogs with as well . I dont think I have ever been that dirty in my life before . Oh well Im very honored to have been a part of this book and a part of helping after Katrina . Be carefull out there among them english and stay well everyone . that on the evening news . It was so distrubing I cannot finish this book . I have never had a book that was so distrubing I could not finish it but this is certainly one of those . I wish I had known this when I sent away for it . It was a paperback swap so I guess I did not have a really good grasp of what this book entailed . So if you are squeemish about any thing as described above then please dont read this book . highly distrubing to me least ways . I just thought I would warn ppl in case you were thinking about reading it and I wish someone had warned me . Okay kids just remember to wash them hands and take care the flu is rampant . As always be carefull out there among them english . Negative Ghost writer :) ! 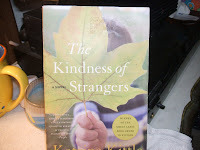 thanks to my book swapping site I am going to have plenty of reading matierial for at least three wks , I have never read any of kathleen kittle was authored the first book you see pictured here as The Kindness of Strangers . 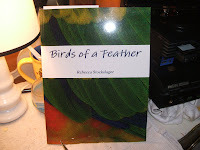 When I get through reading it I will do a review on it as I intend to do with all my books . 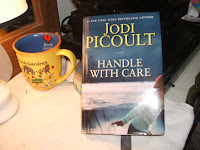 I heard someone say just the other day that Jodi picoult was depressing I find that to be so not true . She writes from the heart and if someone finds that depressing then so be it . I however would prefer an author to write from the heart rather than never expierience it for themselves . however some of the books I have read I would have rather not expierienced it . 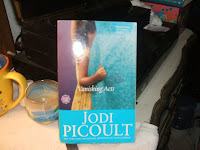 If any of you have any picoult sitting around that you dont want to read or would rather not read than by all means pass my way and I will give you a booklist of what I have and will gladly trade . 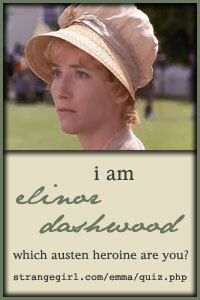 I also enjoy alexander mccall , and several different authors . I like to mix it up a little bit . The only thing I wont read is books about medical examiners and the dark gothic horror series . None of that for me . We have enough bad in the world I dont want to read about it in books .I dont like war books either I figure war is present enough as well . Oh well kids that is all for today be carefull and remember to wash your hands and be carefull out there among them english and for a certain reader : Negative Ghost Rider :) !!! Listen kids I would be blogging more but have had a migraine that does not seem to want to go away . Three days and counting now and I hope tommorow is a better day . I have taken all the medication I possibly can without overdosing . I just pray that tommorow is a better day and I feel much better . Of course I think I would have to be hit by a car to feel better LOL !!! I am also kind of bummed because we are not moving after all due to finances and I really did want to move into a nice place and live in a nice neighborhood . One far better than the one I am living in now . This neighborhood has become a dirty and disgusting mess with some less than desirable folks that reside in this neighborhood . I think that there are good and bad points about the move but it is dissapointing , but I will get over it . I hope that I also get over this maddening migraine . Back to bed I go . This postcard was sent to me by a pen pal and I love it . 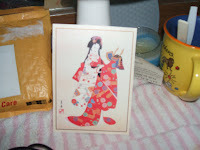 She knows I like oriental things and items and this is just one of the lovelys she sent . There is some oriental writing on the corner but since I dont know how to read japaneese writing I am out of look it is probably just a makers mark of some sort . She sent the other one , the one with the flowers I believe to be a cherry blossom but cant be sure . It is just beautifull though . I really cherish the both of them and hope to keep them for a long time . I consider these cards a gift , a cherished gift . Hi everyone . 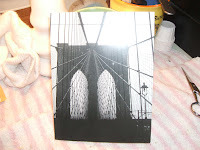 This card was sent to me by a pen pal who lives in New York and those of you who live in New York will know this photo as the Brooklyn Bridge . I love photographing bridges but not walking over them or driving over them . I think it is a deep seeded fear of mine . I guess I have watched too many movies of cars going off of bridges and ppl drowning in their cars . I love this card though and wish I could lay claim to this photo but alas it is not mine . But it is still an awesome photo and one I very much enjoyed receiving . I love my pen pals and my internet friends so much and my mail box is very happy . well enough for now , be carefull out there among them english . Well I just wanted to remind everyone that this is the first day of October and October is Breast Cancer Awareness month . so let us all get out our pink bracelets , earrings , pins what have you and start the solidarity . If you know someone who is fighting this awfull disease then send them a special email , card , letter what have you and let them know that they are not alone . Let us keep them in special prayer as well that God spares them and grants them some relief . Well that is it for now . Take care all and stay well and be carefull out there among them english .